Create a Login Profile or login with your family account! Click here! Click here to review our tuition payment options. Click here to learn more about financial aid opportunities. View our Spring 2019 Classes! NEW! 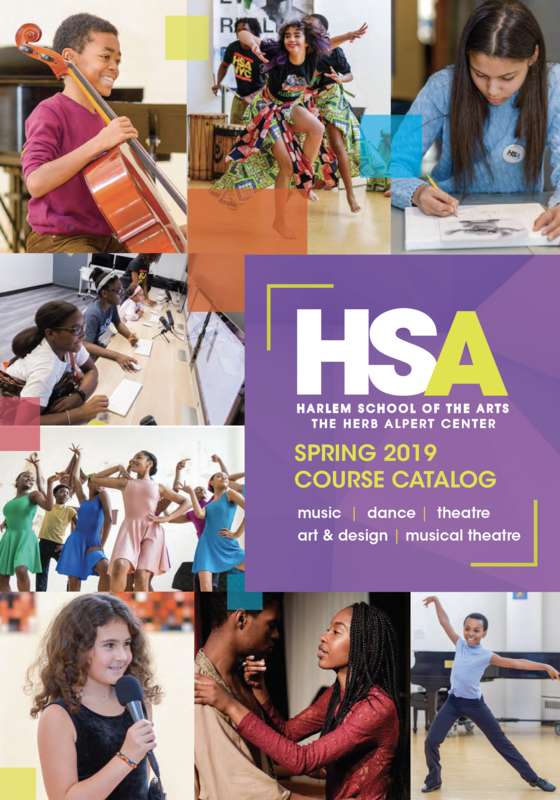 View/download the Spring 2019 Course Catalog. Click here! Welcome to Harlem School of the Arts. We accept all students ages 2-18. Register today for programs in Music, Dance, Theatre, Art & Design and Musical Theatre! HSA Prep Recipients: All recipients must correspond with Tracy Johnson via email: tjohnson@hsanyc.org or call 212.926.4100 x332. Create a Login Profile & Register Today! *Please note that HSA has switched our online registration system from MindBody to ASAPConnected to improve our registration process. ASAPConnected is user-friendly and will expedite the registration process. Additionally, ASAPConnected will provide clear and up-to-date information regarding courses, payments, class updates, announcements and much more. If your child(ren) is a current student, we’ve transferred all of your existing data into ASAPConnected using your old log in (email address).